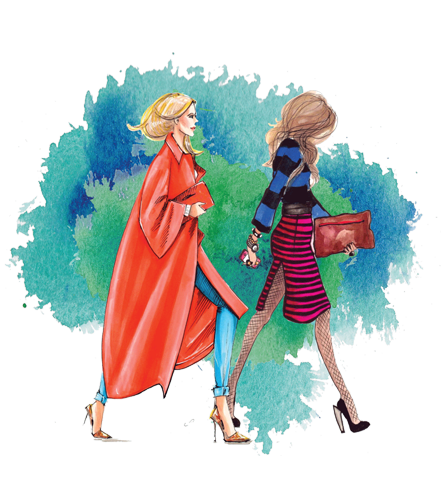 Mira is a specialist in woven and knit apparel manufacturing for both women and children wear. Over the past 33 years, we have established ourselves as a reliable company in the Indian apparel industry. Our customers have remained our partners since our inception and have grown with our reliable and consistent performance. Our commitment is to deliver what we promise with excellent service – first quality, on-time. We offer a complete package of products and services including – punctual deliveries, a high standard of quality and competitive prices. In addition to manufacturing to our customers specifications, we offer our own unique and creative design collections following the latest trends and fashions. At Mira, our merchandising teams look after our customers every need with transparent communication and meet all requirements to an absolute level of satisfaction – from sampling to production. We promise you will appreciate every garment you see and touch. We welcome you to visit Mira in New Delhi, India. 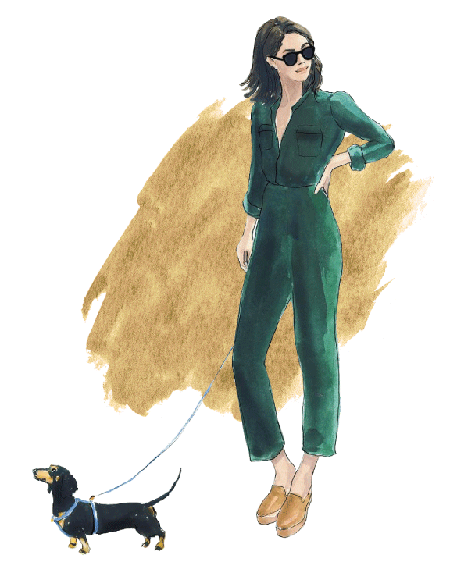 Mira specializes in the production of woven and knit apparel for both women and children. We have the experience and expertise to manufacture any garment with your chosen fabrics, trims, accessories and embellishments. We offer a rich variety of fabric designs, blends, constructions and feels. Our fabric store and sourcing team can procure a vast range of pure and blended fibers of cotton, linen, rayon, denim, polyester, nylon, silk, tencel and more. Mira manufactures a wide range of woven and knit – printed, dyed and yarn dyed garments. We excel at value additions and embellishments like beading, sequin, and endless choices in machine and hand embroideries. 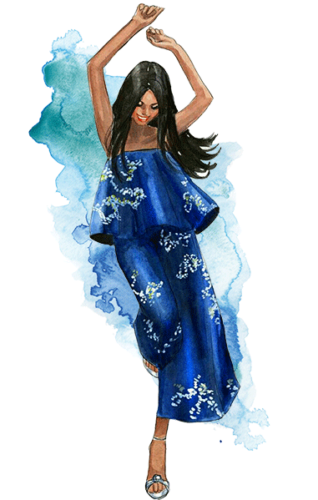 While walking through our production facilities you will observe the manufacturing of tops, blouses, shirts, dresses, skirts, shorts, trousers, nightwear, beachwear, jumpsuits, scarves, bags, hats, various accessories and more. 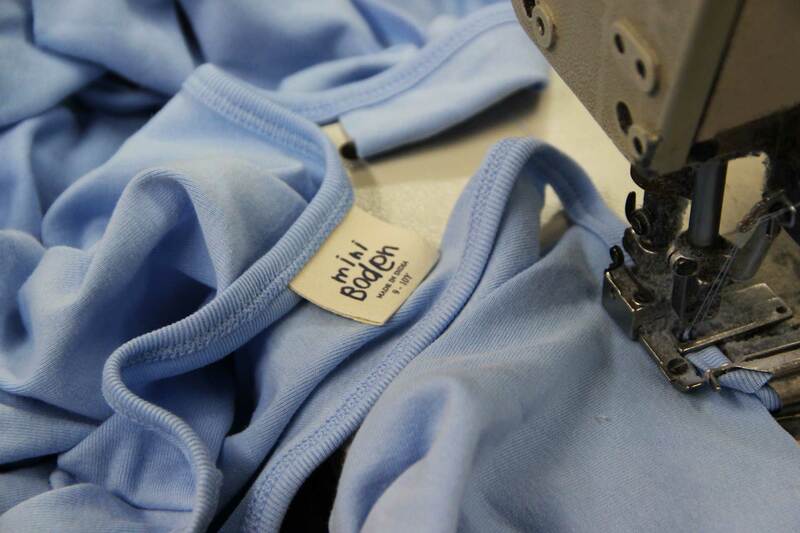 We have an annual production capacity of 3.6 million units of apparel. We have grown by delivering a high quality product and consistent performance to our valued clients. Mira houses state of the art facilities, creating a truly professional and systematic work culture while delivering a durable end product. The total workspace at Mira spans 250,000 square feet. 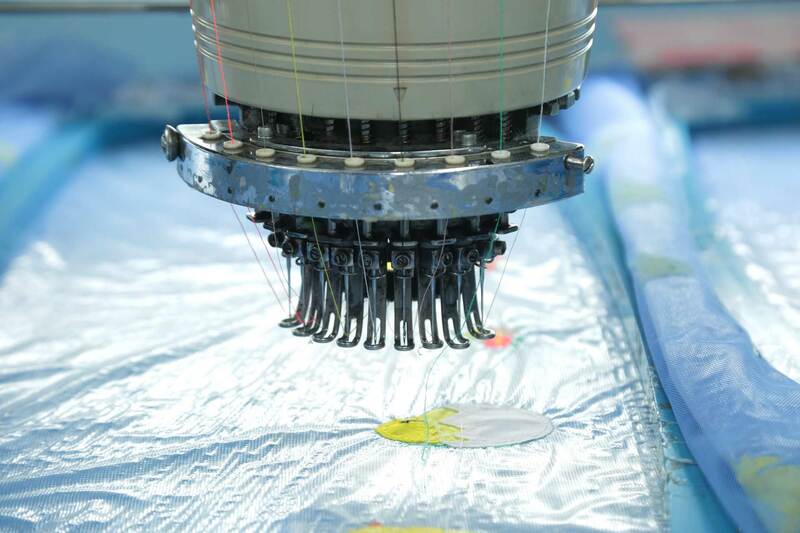 The premises are fully air-conditioned, equipped with the latest – 1200 stitching machines, 200 heads of computerised embroidery and sequin, laser appliqué cutting, steam ironing and spotting, washing, hydro-dryers and tumblers, dry cleaning, fusing, sublimation and reactive digital fabric printing machines. Mira’s design and production teams are supported by the latest software and equipment to maximise output and efficiency by streamlining the manufacturing processes, supported by digital pattern making, grading and nesting tools, and a customised and sophisticated ERP (Enterprise Resource Planning) system. 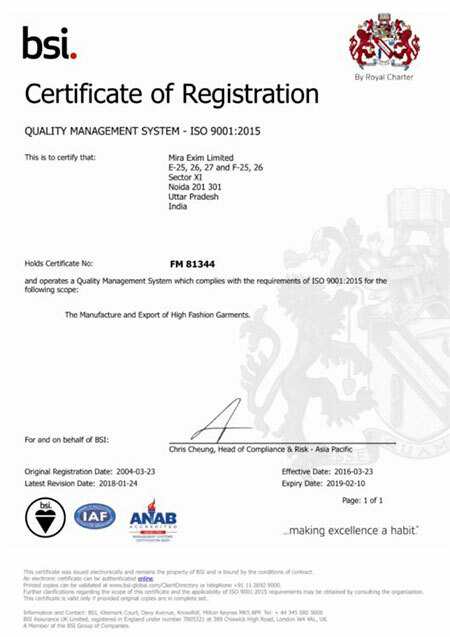 Mira also has an in-house NABL accredited physical and chemical testing laboratory. 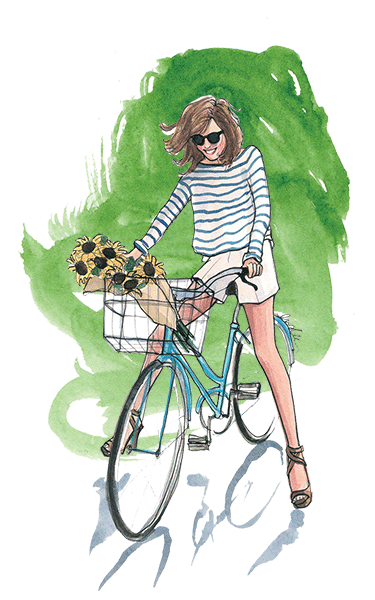 New styles are developed each season after careful study of market trends by our design team. Our showrooms exhibit the latest collections showcasing our strengths and capabilities. Our infrastructure also includes a merchandising and sampling division, a photo studio, product specific finishing, computerised packing and shipping, TQM (total quality management) systems, and separate showrooms displaying our product lines for women and children apparel. Mira’s direct to fabric digital printing facilities are a perfect compliment to our portfolio of services. Our machinery enables us to print 250,000 meters of fabric per month. We print sampling and bulk yardages on demand. Our current product experience includes- apparel, scarves, stoles, bed linen (quilts, bedspreads, pillows and throws), table linen, table mats, runners, napkins, home furnishing, outdoor (blinds and awnings), upholstery, and various bags. Digital printing technology has enabled significant reduction in delivery lead times, increased flexibility towards supporting lower MOQ and overall higher quality and brightness to products. Digital printing also helps achieve sustainability goals by fractioning water consumption and final waste output as compared to traditional rotary and screen printing methods. Our customers have the flexibility to order smaller initial orders for more effective inventory and stock management. Our scale also supports printing large bulk orders with fast turnarounds cost effectively. Mira invests on research and development from the start of sampling and product development, to ensure products are production friendly and can be produced with consistency in high quality. Our rigid production quality control methods require an initial pilot-run, followed by a primary inspection, multiple mid-line inspections, an end-line inspection, and a final inspection before packing to complete the manufacturing process. All materials are tested in our state of the art in-house laboratory before being released into our inventory. Our in-house textile laboratory has been accredited by National Accreditation Board for Testing and Calibration Laboratories (NABL) for chemical and mechanical testing. 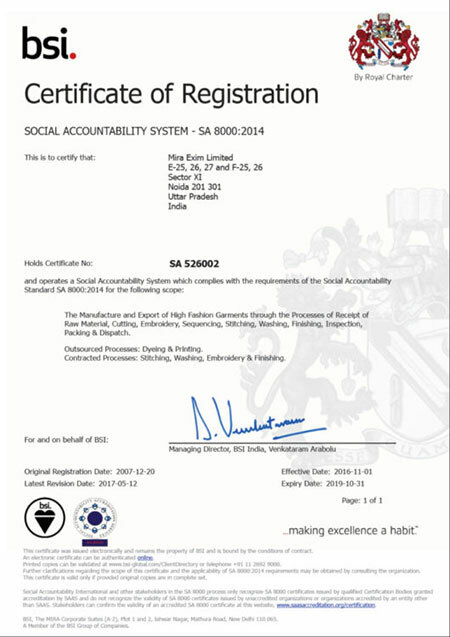 Mira is an ISO 9001:2015, SA 8000:2014, SMETA – SEDEX, and BSCI certified organisation which follows all required levels of international standards including fulfilling and successively improving the maximum requirement for Corporate Social Responsibility (CSR). 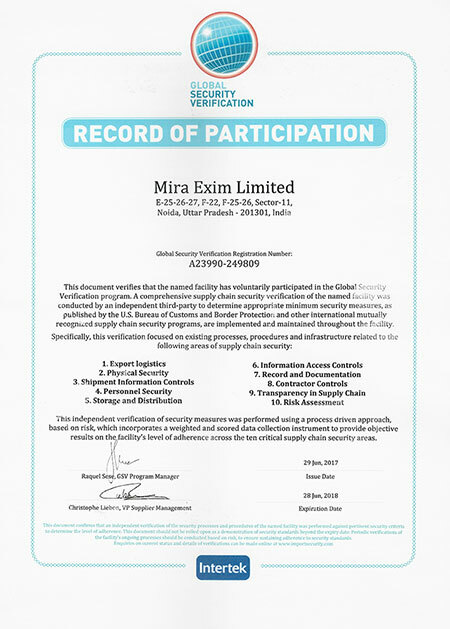 As part of enforcing and adhering to the international supply chain security standards, Mira has been granted Global Security Verification (GSV) certification which integrates multiple global supply chain security initiatives, including C-TPAT, PIP and AEO. 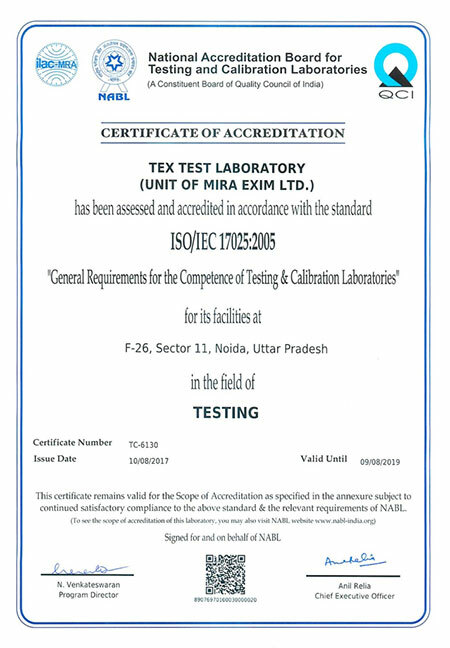 Mira also has an NABL (National Accreditation Board for Testing and Calibration Laboratories) certified Lab for testing fabric, trims and garments – which augments our endeavours to support our customers every need. We ensure a work culture and environment that promotes environmental friendliness, safety, reliability, efficiency and ethical business practices while dealing with our customers and suppliers. Mira’s newest initiative adds the capability of manufacturing leather products to our services. We source various exotic materials from around the globe with which our skilled artisans manufacture goods of very high standards. 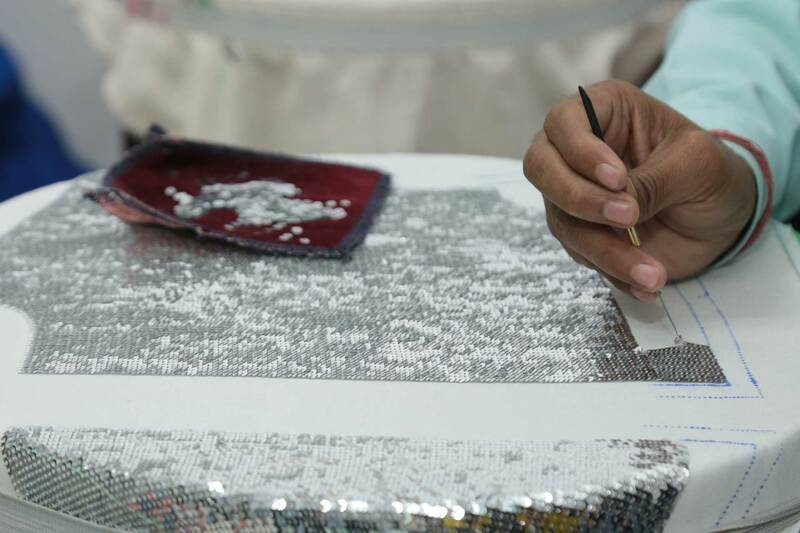 Our artisans use both machine and hand work techniques during the process of manufacture. We specialize in mobile phone and computer accessories that include phone and tablet cases, sleeves, laptop cases and bags, desk mats, mouse pads and several other electronic integrated accessories.